Found one file extension association related to Business Card Factory and 1 file format developed specifically for use with Business Card Factory. 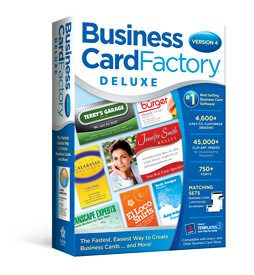 Art Explosion Business Card Factory Deluxe lets you easily create professional business cards in just minutes. Guaranteed! Choose from 4,200+ customizable templates for virtually every type of business. Or create your own designs with 41,000+ clip art images, including 750 logo elements. Then print your cards with micro-perforated card stock from Avery, PaperDirect and other manufacturers. If you need more information please contact the developers of Business Card Factory (Nova Development Corporation), or check out their product website.